Reactive arthritis is usually a transient acute arthritis appearing a few weeks after an infection somewhere in the body, mostly located in the urinary or the gastrointestinal tracts. It usually involves large joints, such as knees and ankles as well as the feet. 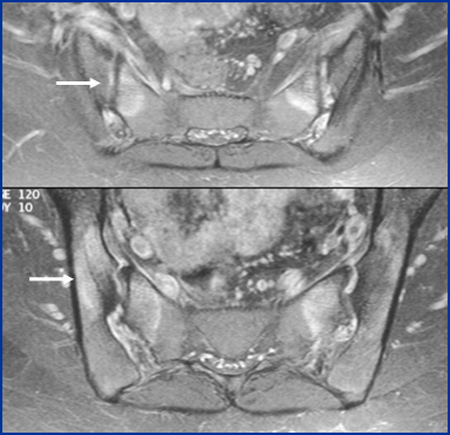 There may be inflammatory changes located to the sacroiliac joints in the acute stage. The disease usually disappears after some months, but may recur and can develop into a chronic condition. This is especially the case in patients with the tissue type HLA B27. 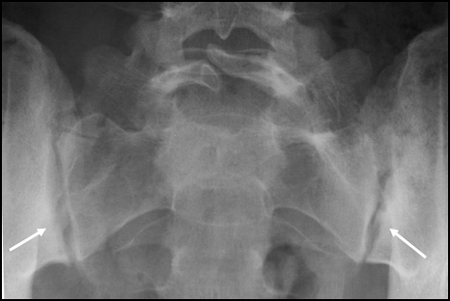 Patients with a chronic course often have involvement of the sacroiliac and/or spinal joints. 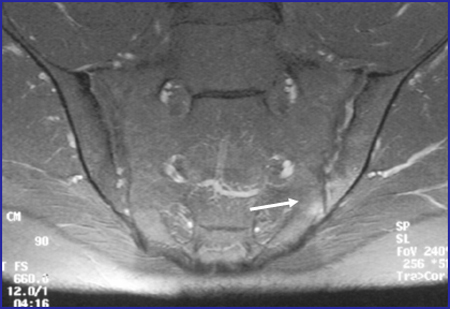 Early MR changes of the sacroiliac joints as part of reactive arthritis are usually confined to the distal part of the joint containing synovia. In transient arthritis the MR abnormalities consist of uni- or bilateral bone marrow oedema adjacent to the joint as a sign of inflammation. Chronic changes such as erosion and fatty deposition are usually lacking. The changes may therefore heal without sequels. There is always a risk of recurrent episodes of inflammation and the disease may transform into a chronic stage. The imaging features can then be AS-like except that chronic spinal changes often present more voluminous new bone formation than seen in AS. Semi-coronal T1 FS image + Gd. showing slight left-sided changes in the form of contrast enhancement in the joint space and surrounding bone (arrow). The sacroiliac joint changes are more pronounced and include chronic changes in addition to signs of activity. Semi-coronal T1-weighted image shows erosion of the joint facts (arrows). Semi-axial T1 FS images after iv. Gd. 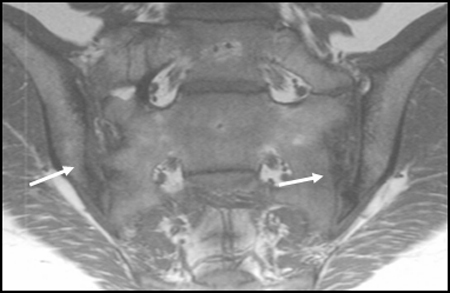 contrast showing pronounced bilateral osseous inflammation (arrows) mixed with erosion and osseous sclerosis on the iliac side of the joints. Simultaneous radiograph shows definite changes in the form of erosion with subchondral sclerosis (arrows). Coronal and sagittal T1 FS images after iv. Gd. 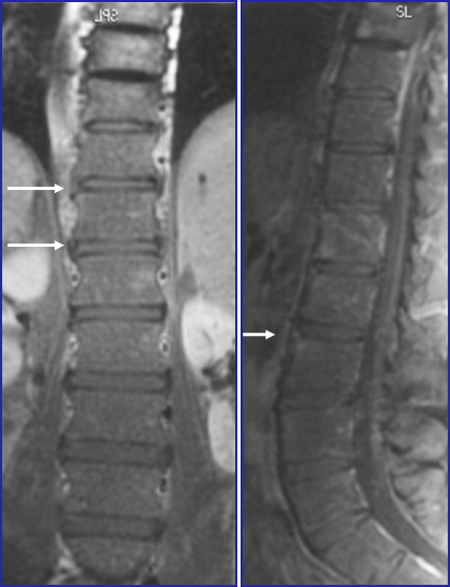 contrast showing enhancement at the corners of vertebral bodies and signs of new bone formation around the discs (arrows), which are often better visualised by radiography. 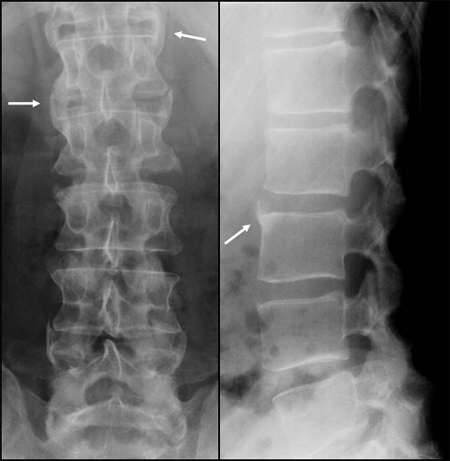 Simultaneous radiographs, frontal and lateral views, showing chronic changes in the form of new bone formation around the discs which are more voluminous than seen in AS (arrows).